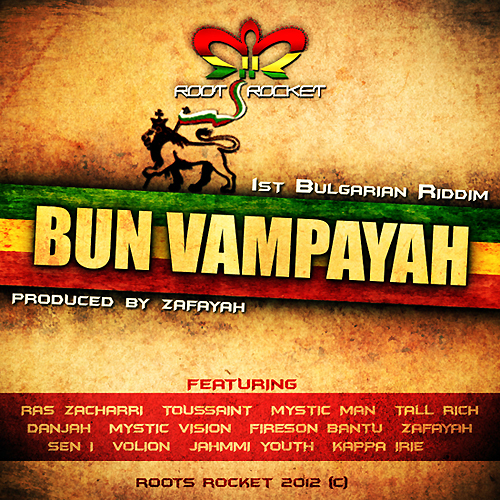 Check out the first single from the “Bun Vampayah” riddim compilation /produced, mixed and mastered by Zafayah at Roots Rocket Studio/. A tune called “One Round” by Ras Zacharri (Jamaica). Each week two new songs we will be uploaded, followed by the entire release. Stay tuned for the second track which is to be released this weekend. Share the vibes if you like what you hear! Bogle Broadie AKA Ras Zacharri is one of the most vibrant, upcoming new reggae artistes straight out of Jamaica. Born in Border, St. Andrews he currently resides in St. Ann’s J.A. Music has been his life since his youth, recording from the age of 17. He got his first release in 2000 under the name of ‘D.J.Bogle’ with “Irish Moss” on the Stumpy Productions Label. Whilst continuing to DJ on various Jamaican sounds and develop his style, Bogle Broadie AKA Zacharri also a very talented Producer, founded the label “2CUS Productions” with his cousin (Austin Green). This venture began in 2002 and Zacharri worked with and produced some of Jamaica’s most prominent artistes such as Jah Cure, , Sizzla Bounty Killer, Beenie Man, Assassin…just to name a few. In 2006 he started to work with Starr Gate crew and Roots Garden Records , which released the mightily voiced “When Jah Wrath” 45.This was followed by the release of “River Jordan” with Luciano , a legendary single played internationally for which Zacharri received much recognition. Since , he has contributed to many successful international productions including his own Shem- Ha- Boreh label which was the origin of his debut album “Herbsman” (2009) recording with Luciano, the late great Gregory Isaacs and the man from the east Natty King . “Herbsman” received a global response from an eager audience, building him the well earned reputation as the “Herbsman”. Again the second album “New Horizon” (2011) on his Shem-ha Boreh label, featuring Earl Sixteen , Mark Tenn & Tiwony was greatly received. Zacharri’ s recently released third album “Rootstep”, is collaboration with “Roommate” San Francisco’s dubstep producer, and is thick with powerful vocals over dubstep riddims featuring Chezidek, Susan Cadogan and Junior Kelly( King Dubbist Label). With a constantly expanding catalogue of CDs, 7” & 12” his records are circulating globally. Since his emergence, Ras Zacharri has graced the stage of Reggae Sun Seine (FR), Sommand (FR), Ostrodo (PL), Reggae Na Piaskach (PL), Waterproof Festival (FR), Festa Del Sole (IT), as well as other bookings in, Bulgaria, Slovakia, Slovenia, Czech Rep, Amsterdam and Portugal etc… In all these shows he received an engaging vibe and showed the audience that he had indeed arrived. Zacharri’s music continues to grow popularity, as both a recording and touring artiste .He is currently working on a new album on his own Shem-Ha- Boreh label so you can look out for more uplifting and conscious vibes from the ‘Herbsman’.